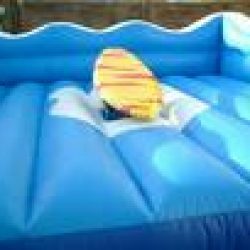 Your guests are in for a fantastic time as Absolute Bounce gives you a thrilling ride, simulating an experience just like being out in the open ocean. 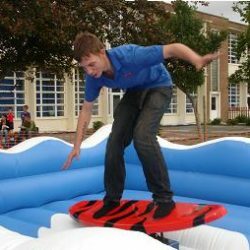 As well as the simple entertainment of people trying to stay upright and falling off, Absolute Bounce can arrange to run a competition during your event. Each Surf Simulator control station comes with a timer that will record each riders time, enabling us to keep track as to who is doing the best or the worst during the event. 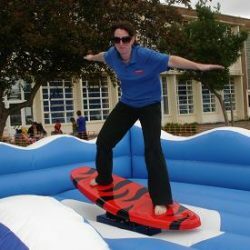 The Surf Simulator can be a great feature at any event; so whether you are planning a large scale family fun day or a simple birthday party in your back garden, the simulator is guaranteed to have everyone walk away from your event with a smile on their face and a fun story to tell. Safety is of paramount importance at Absolute Bounce. All of our staff have been given full training on the set up and operation of our simulators. 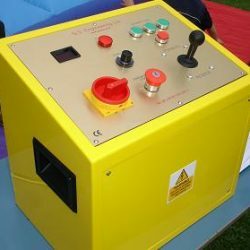 They have full control of the ride from start to finish, it is controlled using an 2 way direction joystick and speed dials on the control station. 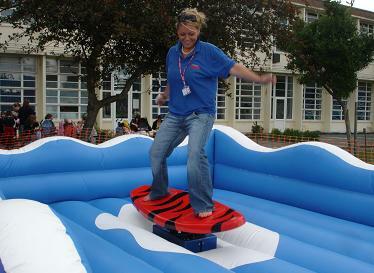 Once a rider has fallen off the surf the joystick is released, stopping the ride instantly and preventing any risk of the rider being hit by the moving board. 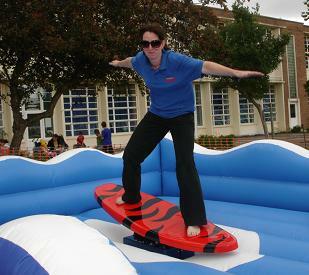 Our surf simulator provides great family entertainment all year round for both adults and children. 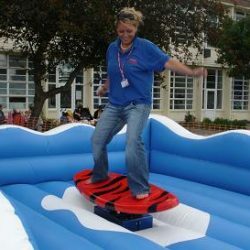 It can be used for indoor and outdoor events, such as Hawaiian nights, corporate events, garden parties, BBQ’s, weddings, birthdays, fetes, Shows and Fundraisers. 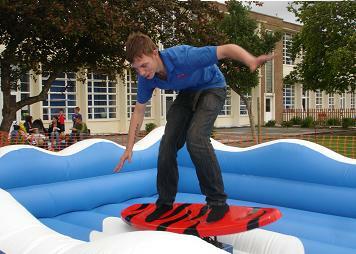 Whatever type of event that you are having, this will be guaranteed to provide lots of fun for all. Additional hours can be added for an extra charge. Why not give us a call to discuss your event today. Please take the time to look at our other fantastic products and services.